This Opal doublet necklace has a "Pacific Garden", tropical feel with an aquamarine Lightning Ridge Opal doublet with flashes of greens, yellow and orange. The gemstone is set in a 925 Stirling silver twisted wire "floral basket" with Stirling silver twirls and a silver flower motif. 2 Swarovski AB crystal beads add extra sparkle to this enchanting necklace. This handmade necklace from Aristocrat Tiaras is part of our Opal jewellery collection for one special mother of the bride or lady to enhance her outfit or makes a exquisite gift for any special occasion! 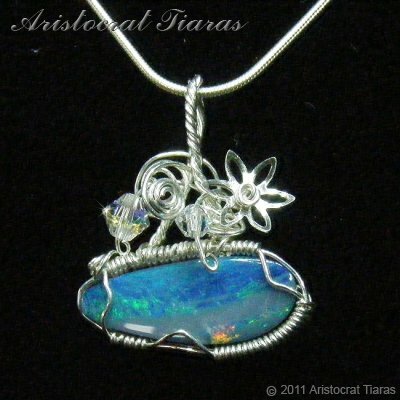 Please note: the Opal is one off gemstone and is unique, the pendant shown is the actual item for sale and can not be duplicated. All our jewellery is handmade in Herefordshire UK. Due to monitor display, colour may vary slightly from the picture. Ready to ship! This necklace could be with you by 1pm Saturday 20th April (tomorrow).